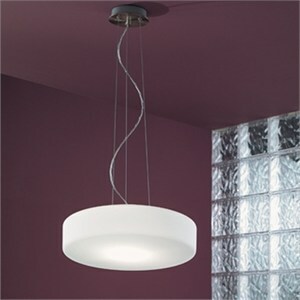 Handblown white satin-finish glass pendant light. Satin nickel canopy/suspensions with clear cord. Made in Italy. Design: Studio Tecnico Vetreria Vistosi. Dimensions: 21.5"W X 3.25"+47"H. Uses 2x100W E26 (E26 Med. Base Incand. A19) bulb.